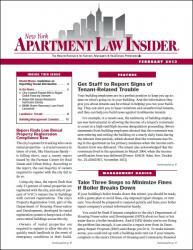 Plus, every issue of New York Apartment Law Insider comes with exclusive working tools to help implement new regulatory changes--everything from our annual rent calculation form to get-tough action letters and sample lease clauses drafted by top practitioners. 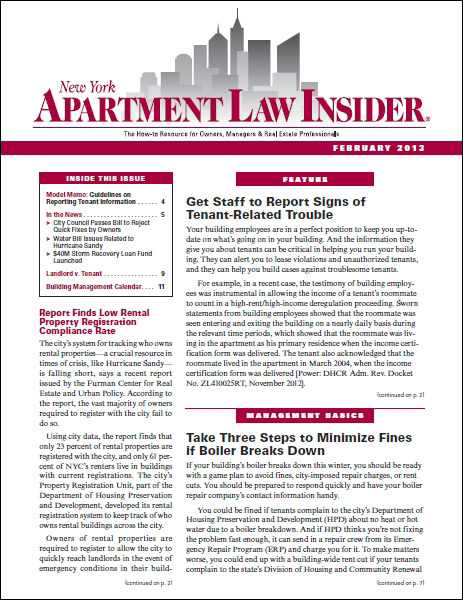 New York Apartment Law Insider also includes features like Building Management Calendar, Q & A, Dos & Don'ts, and more. Gain an advantage over your competitors, and let your tenants know who's running the show. New York Apartment Law Insider is the key to increasing your profits, staying compliant with rules and regulations, and keeping control of residents. Available in both print and online editions, The Insider has you covered.